Emily Readett-Bayley has worked in Bali for over 20 years perfecting a collection of wooden decorations crafted by a rice farmers co-operative who for centuries have carved and gilded wood to decorate their Hindu temples. Today these communites also cultivate fast growing albiza trees around their rice fields and carve the wood into intricate shapes and sculptures that can be sold on the domestic and global markets. This provides them with a vital secondary income and enables them to maintain their traditional methods of rice cultivation and preserve their unique Subak heritage which has been recognised by UNESCO. The wood carving, gilding and painting skills of these Balinese artisans are second to none and combined with Emily’s own British design background and knowledge of Western markets the collection is unique. 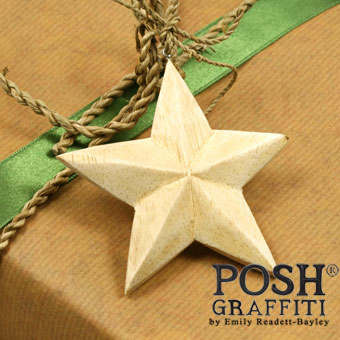 Handmade decorations designed by Emily Readett-Bayley have been sold in many of the best stores in the world including Bergdorf, Conran, Harrods, Heals, Neiman Marcus, Liberty, Nina Campbell and John Lewis. In addition to albizia wood Emily also works with recycled and salvaged materials including : driftwood, bamboo, rattan, reeds, grasses, cloves, coconut shells, feathers, mother of pearl and glass.